Here’s what you need to know about fire-rated glass and framing common misconceptions to get started on your next project. What are the common misconceptions about fire-rated glazing? One of the biggest misconceptions among architects regarding fire-rated glazing systems is that they cannot match the aesthetics of regular window glass and frames. At one time that was true: fire-rated glass meant institutional-looking wired glass, while fire-rated frames were bulky and somewhat unsightly. Today, though, design professionals have access to a wide range of beautiful fire-rated glazing systems. For example, fire-protective glazing products, such as TGP’s FireLite® family of fire-rated ceramic glass, can be ground and polished on both sides. The resulting glass has a smooth surface finish, high visible light transmission and low reflection. And, fire-resistive-rated transparent wall panels such as Pilkington Pyrostop® offer nearly the same level of visual clarity as ordinary float glass – all without wires. Likewise for fire-rated framing systems, design professionals now can specify sleek assemblies for windows, doors and curtain walls. A case in point is new generation steel fire-rated frames. The frames are formed in an extrusion-like process that results in thin profiles, with well-defined edges that more closely match the look of non-rated frames. Where necessary, design teams can specify these frames in a wide array of colors, materials, and finishes. This helps to better match the fire-rated frames with neighboring door, window and curtain wall applications. In addition to defending against the spread of fire and smoke, modern fire-rated glazing is available with high impact safety and bullet resistance ratings. Building professionals can select from products with a superior level of fire and impact protection, including laminated fire-rated glass ceramic and fire-resistive glazing products that meet either CPSC 16CFR (Category I) or CPSC 16CFR 1201 (Category II) impact classifications. Such products satisfy the 2006 IBC impact-safety requirement for fire-rated glazing in hazardous locations. They do not shatter, or shatter in a safe pattern when struck by people or objects, providing critical protection in high traffic areas. 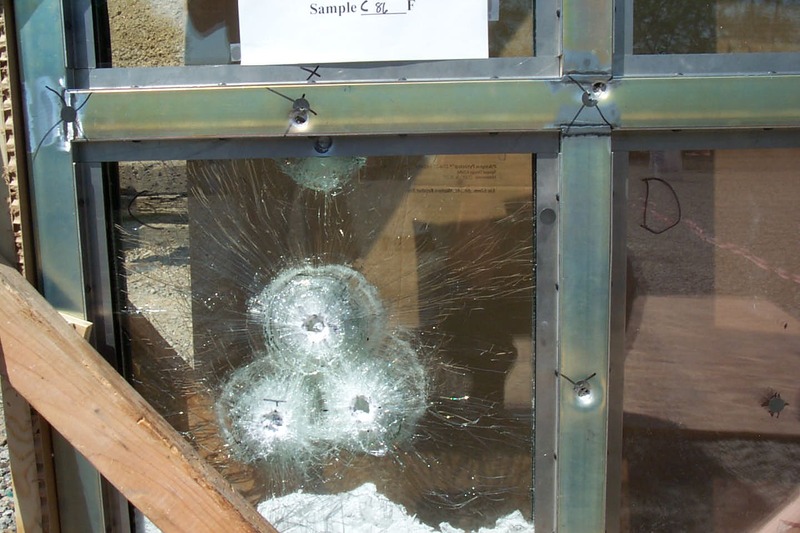 Select fire-rated glazing products are also available with bullet resistance ratings. For example, Pilkington Pyrostop® fire-resistant transparent wall panels are available as a single glazing panel with up to a Level III bullet resistance rating and two-hour fire ratings. Such products can help delay intruders and enable occupants to see danger approaching, while also standing guard against the threat of fire. These multifunctional products are ideal for entryways and other areas where improved security is critical to the wellbeing of occupants. A common misconception is that high-performance fire-rated glazing systems cost too much. As they're increasingly under constricted budgets, architects are questioning every building element. 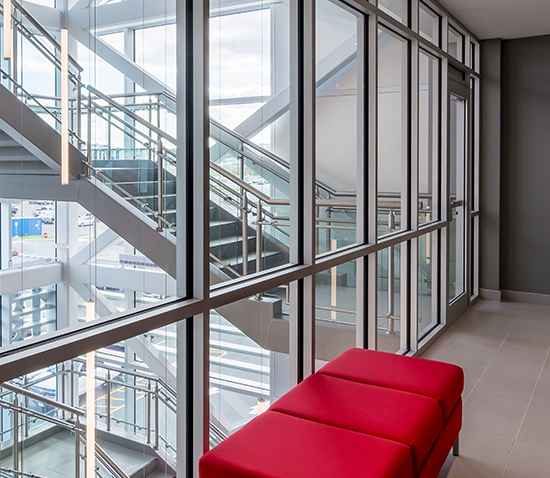 Those who are used to working primarily with traditional polished wired glass, sometimes ask if modern high-performance, wireless fire-rated glazing is worth the extra cost. With today's wide range of products, from ceramic glazing to transparent wall panels, TGP usually can help you find a solution that meets your project’s budget. Where an initial investment with advanced fire-rated glazing may be greater than the architect and their client expects, TGP can make a special effort to help the design professionals and building owner understand what life safety and performance benefits they’re purchasing. For example, the typical K-12 school building is designed to last 30 years or more, which provides a lengthy time to amortize the costs of critical life safety products. In addition, while a low-cost option might save on upfront expenses, it can lead to high costs from accidents, injuries or repairs in the future.